Coach Slava Koulikov reckons his new-look Peterborough Phantoms squad are already proving people wrong. The city club have picked up pleasing home successes against a highly-touted Swindon side and reigning champions Basingstoke in the opening two weekends of the new English Premier League season. And while Phantoms are yet to open their account on the road after suffering defeats at Sheffield and Milton Keynes, Koulikov insists their Planet Ice form shows they are capable of challenging for a place in the top half of the table. Koulikov said: “The two results and performances at home so far have been very pleasing. 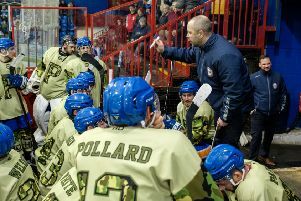 “We have shown we are capable of scoring goals, working solidly as a defensive unit and playing a hard-working style of hockey in our own building. “Beating Swindon so well in our first home game was great for the confidence of the guys. You don’t get a scoreline like 6-1 too often in such a tough league. “And to follow it up by beating Basingstoke was another fine effort. You always know what sort of game you are going to get against them, but we were prepared for that and the two points were well deserved. “While the scoreline was tight, we had far more clear-cut chances in the final period and could have won the game more comfortably. “We’ve had a couple of tough Saturdays on the road so far, but the responses we have had on successive Sundays have been very impressive. “A lot of people seemed to write us off before the season started, and I was not surprised by that. “They will have looked at the guys who left, the guys we signed and the fact we are an import down on the other teams. “But I believe in the players and structure we have here, and we are already showing we can compete. Phantoms face a reverse of last weekend’s fixtures this weekend. They go to Basingstoke on Saturday (6.30pm) and then host Milton Keynes on Sunday (5.30pm).